Last Updated: March 8, 2019 · Published: May 16, 2016 By: Asian Caucasian Leave a Comment This post may contain affiliate links or sponsored content. Who doesn’t love “egg-in-the-hole” for breakfast? Here’s our take on this classic dish, with a slight Asian twist! My super talented nieces, Jordan and Kaley, recently made me this plate of yum. It was so delish that I had to recreate it and cranked up the heat with Sriracha sauce. Serve it with a side of toast and berries, and breakfast is served! Slice avocados lengthwise into halves and remove pits. Using a melon spoon or teaspoon, hollow out the holes in the avocado to make enough room for the eggs. Place avocados in a baking dish. Break the eggs individually, separating the yolk from the white into a bowl. 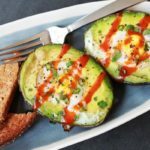 Pour the yolk into each avocado half and then carefully pour the whites into each half, making sure not to spill over the avocado. Sprinkle each half with salt and pepper. Bake in the oven for about 12 to 15 minutes or until eggs are cooked. Use less time for runnier eggs. Remove from oven and drizzle with Sriracha sauce. Garnish with green onions and cilantro. Serve immediately. This dish is always good with a side of toast and berries!